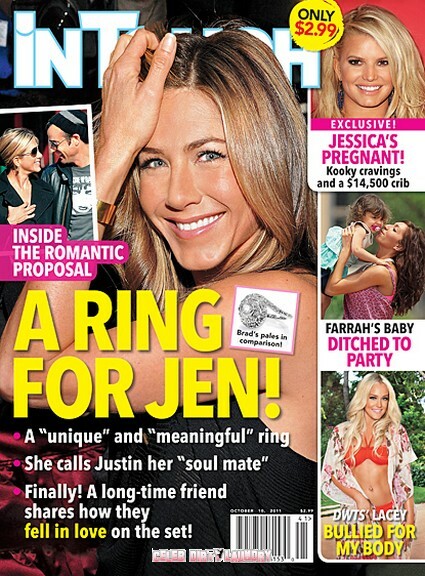 The October 10th issue of In Touch Weekly features the cover story ‘Inside the Romantic Proposal, A Ring For Jennifer Aniston.’ Last week the tabloids were all over Jennifer Aniston and her reaction to Brad Pitts less than nice comments to Parade Magazine about Jennifer and their marriage. This week the tabloids have her getting married again! If Jennifer got married all the times it has been rumored she would and gave birth as many times as she has been rumored pregnant she would have a dozen husbands and a dozen children. Apparently Brad Pitt’s ring he gave her is nothing compared to the rock Justin Theroux is going to give her. In Touch would know right??? What do you think will Jennifer get to the altar this time? Is Justin Theroux the man for her? Sound out in the comments below! If you need to find out all this and more pick up the current issue of In Touch Weekly!